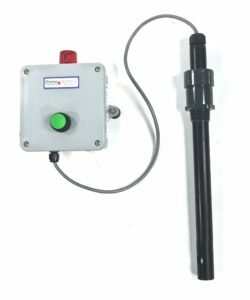 Intrinsically Safe Alarm box connects to any simple apparatus like a float switch. Produces a loud alarm and flashing LED. Uninterruptible battery power is always on. 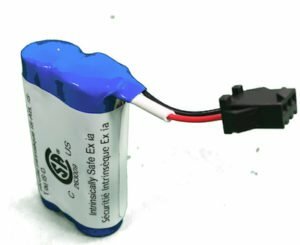 Replaceable lithium battery lasts for years. Durable. Built for rough, wet and corrosive environments. 60079-0 and 60079-11. Zone 0. 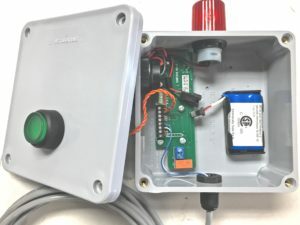 Connects to a normally closed (or open) contact and converts it to a loud buzzer and a flashing LED. Often used with Gizmo Engineering liquid level switches. 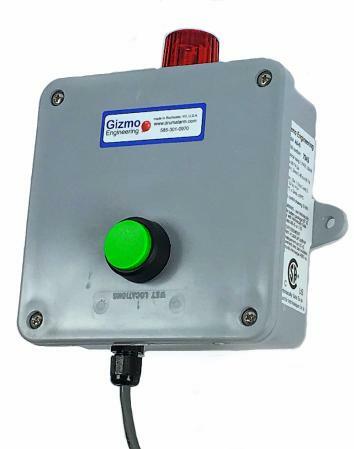 The 101 dB buzzer has a unique warbling sound that cuts through the sound of the factory. At the time of a level conditions, the buzzer sounds and the beacon LED flashes. At this time the front button will turn off the buzzer. In the default mode, the LED continues to flash until the liquid level is corrected. Resets automatically when alarm condition is corrected. If not in alarm mode, then the front button checks the alarm. automatic or manual reset after level correction. relay output delayed 15 minutes. Durable PVC enclosure is tested and certified for IP65. Suitable for outdoor use and aggressive conditions. 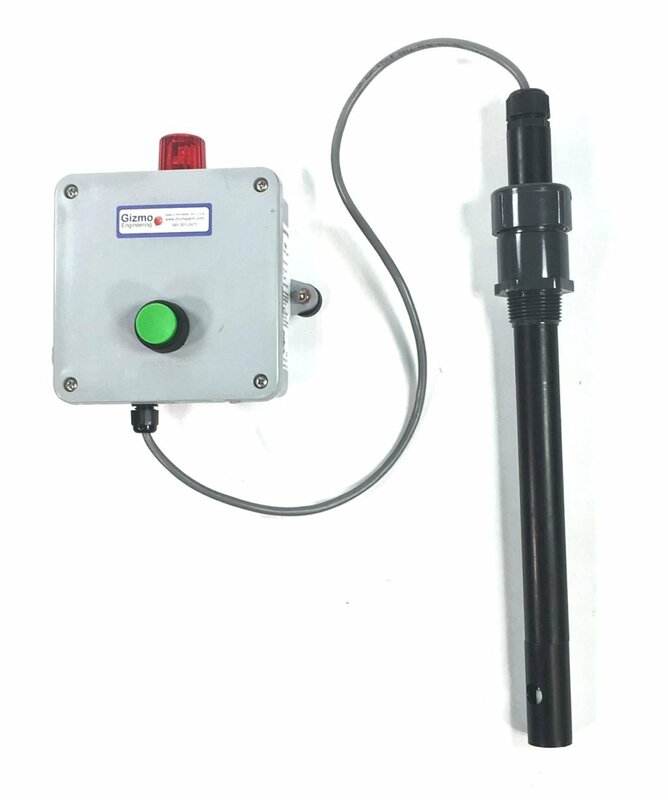 Temperature range from + 60ºC to -40º C.
The alarm box can be connected to any “Simple Apparatus” such as temperature switches, flow switches, pressure switches and more. 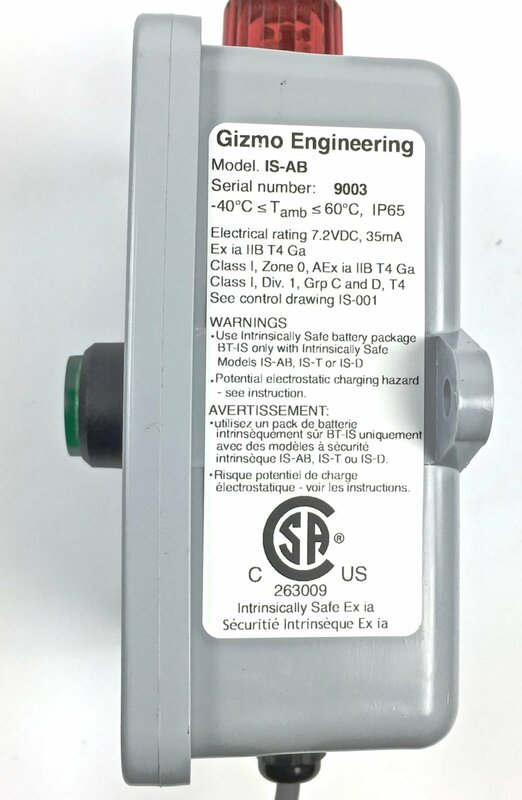 The enclosure is suitable for outdoor use down to -40 deg. C.
The cable connecting to our float switch level probes is PVC jacketed 0.8 mm [0.031 inch] thickness. For the 316 stainless steel level probe, the wetted parts are 316 SS except the retaining rings on the float switch which are 15-7SS. Click here for chemical resistance chart. The alternative level switch construction is polypropylene which is suitable for temperatures up to 200 deg. F [93C] Click here for a chemical resistance chart. 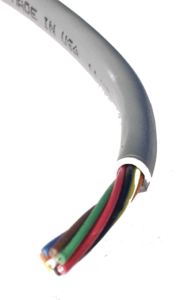 We stock other float switch and pipe materials too like PTFE and Kynar. Please call us for more information on these. There is only one model of aI.S. alarm box which is model IS-AB. Stainless steel float switch mounted in a rigid stainless steel pipe mounted with 1 inch NPT. Includes 10 ft. cable. Float rigid polypropene pipe mounted with 1 inch NPT cord grip. Attaches to the supplied 10ft cable.